Jeff Williams joined the Department of Physician Assistant Studies in 2018. 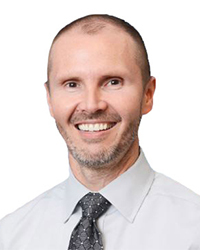 He has been practicing as a physician assistant in the primary care specialties of internal medicine and family medicine since graduating from PA school in 1999. In addition to his work as a clinician, he brings experience as a physician assistant educator having served as assistant professor and associate academic coordinator in the Department of Physician Assistant Studies at the University of Texas Southwestern Medical Center’s (UTSWMC) School of Health Professions for almost six years. During his time at UTSWMC he was inducted into the Alpha Eta Allied Health Honor Society, Pi Alpha National Honor Society for Physician Assistants, and selected by his students in 2015 to receive the Outstanding Faculty Member Award. His service includes work with the Physician Assistant Education Association’s (PAEA) Assessment Council where he contributed to End of Rotation, PACKRAT, and End-of-Curriculum exam products published by PAEA for use by programs across the country. He is a member of the American Academy of Physician Assistants (AAPA), California Academy of Physician Assistants (CAPA), and PAEA.